Our SmartView 2.0 Monitoring system allows you to monitor data on the overall health of your elevator system 24-hours, 7 days a week via your computer, smartphone or tablet. Our robust system sends alerts when needed to those that can quickly take care of issues; minimizing downtime and improving customer satisfaction. 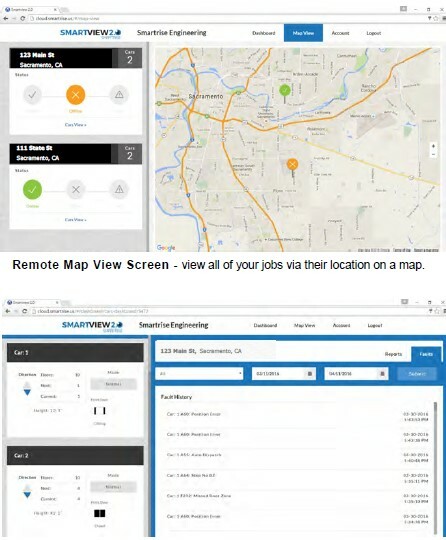 The SmartView 2.0 Monitoring was developed to provide Building Owners, Property Managers, and Service Contractors with an easy-to-use tool to track multiple cars across multiple geographically-dispersed jobs from any web-connected device. SmartView 2.0 delivers the ability to run real-time or historical, graphically-displayed reports, send hall calls and car calls. Sign up today for SmartView 2.0 Monitoring. Start monitoring your job activity outside of the machine room by calling 916-457-5129 and press 1 for Support. Ask for SmartView Subscription Payment. Your subscription will be $60/year per car. We take Visa, Mastercard, and American Express.